The sheep is the eighth symbol in the Japanese Zodiac. As sheep live in flocks peacefully, they were considered as the symbol of a happy family life. This sign represents “peace” and “security”. Sheep are caring, considerate, sympathetic, and they cherish friendship. They are endowed with artistic talent, and are passionate in whatever they do and believe in. However, they are very sensitive and tend to worry unnecessarily over small matters. Are keen to learn new things. Sheep are compatible with rabbits and boars. If these three come together, it generates a great positive power. Sheep also have a mutually beneficial relationship with horses. Oxen are the least compatible with sheep. 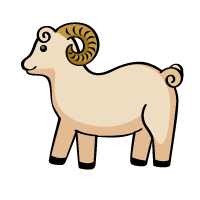 In Japanese, a sheep is “hitsuji” in romaji, and is written as “羊” in kanji. In the Japanese Zodiac, however, it is written as “未”.